Structural Steel Sawing in Houston | Steel Supply, L.P.
Our array of premium saws process structural steel, and other metal accurately and efficiently. No quantity is too large. Just tell us the lengths, quantities, and specs you need and leave the rest to us. This saw may be the new kid on the block here at Steel Supply, but it is mighty powerful. Even the toughest job, the most intricate angles are no match for its prowess. Learn More about it here. Steel is no match for these fellas. Fraternal twins with slightly different setups, but the same core. Their reputation as the saw to rule them all has given them an ego the size of a warehouse. We keep these two on opposite sides of Houston. Who knows what would happen if we put them in a room together? Cutting Capacity: 32" x 28"
Our Hydmech Miter saw is a wild and crazy guy and often a pest to the big Hydmech twins. He is constantly taunting them with "I can do this and you can't", about his ability to swing around and make those tough miter cuts. He may be a bit older than the others but is a workhorse nonetheless. Grampaw Hem cuts huge bundles or single steel profiles like he’s as young as the newer fellas. Cutting Capacity: 25" x 25"
These two often wish they could play with the big boys. They cut through steel with ease… but just one piece at a time. These two play it fast and loose with small sawing jobs. They grind away making 20’ pieces fit into a sedan and other quick on the spot tasks. We carry the little devils' clones if you need one for your shop. Jose keeps one of the twins and Angelo in line and productive at our Northwest location. He can cut a mountain of parts right to your specs, saving you lots of time. Dwyane manages the Hydmech twin at our South location. Keeping this saw in line is a tough job but Dwyane keeps the feed moving. 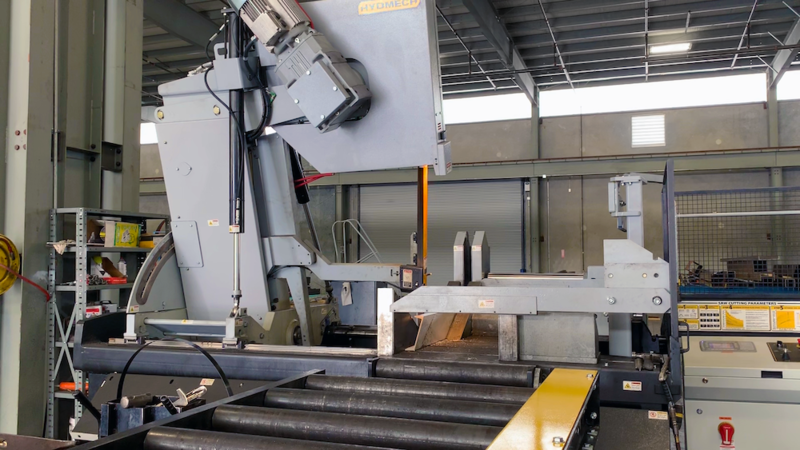 Your custom specs are input into specialized software that tells the saws how far to auto feed the material between cuts and what angle to cut. Our fully automated saws take care of the rest ensuring precise, reproducible cuts. Our skilled operators standby to monitor the process to guarantee superior quality. In the video above we are working on a job that involved processing aluminum square tubing for a customer to use in an air intake system. A crane placed each 24-foot-long 8” Square tube onto the miter saw conveyor. The saw then cut each tube into seven 31” sections and partially mitered each end at a 45-degree angle. Operators used compressed air to remove metal shavings from the finished pieces and then stacked them on pallets to the end customer for final fabrication. Leaving the sawing and mitering to us saved our customer valuable time and allowed them to finish their project on time and under budget!